Our mysterious new show is almost done! Not that it's a mystery show... but we're not saying it's NOT a mystery show either. We can't tell you yet. Because it's a MYSTERY. The website gets a few tweaks and updates, and we do so hope you'll drop by at chat with us on Discord (which we now made it marginally easily for you to find). We've got preview trailers for "The Kingery" episode 10x02, The Pendant Shakespeare's "Richard II" act III, and "Seminar" episode 86, and Jordan and Kaitlyn Kliman discuss being snarky and sarcastic, and escalator things! Let's all go visit the ice cream van in real time! What's news this week? A bunch of stuff, which we're now going to tell you about, as that's generally what these preview blurbs are for! There are some behind the scenes personnel changes, as well as updates to the wiki and the awards section on our website. We also discuss the brouhaha re: the Parsec Awards, and holy crap, we're on Spotify! Do a little dance! Are you dancing? You'd better be. We've got preview trailers for "The Kingery" episode 10x01 and The Pendant Shakespeare's "Richard II" act II part 2, and Jordan and James Rossi discuss car repairs, 534 wiki pages, and how information is cool. Just so, so cool. We've got new on not one, not two, but THREE brand new shows in development! And, uh, you may be somewhat familiar with one of them already... The website has a new wiki, transcripts are on the way, and you folks downloaded our shows 572,000 times in 2018! Holy moly! Thank you for listening! We've also got preview trailers for "Richard II" act II part 1 in "The Pendant Shakespeare", and "Seminar" episode 85, and Jordan and Pete discuss cities in Italy and how writers are never done. The universe will never be the same. 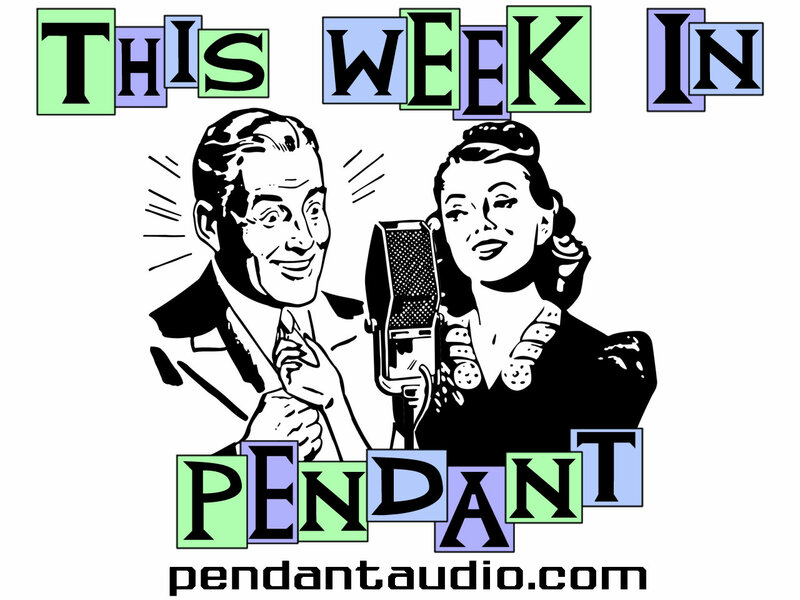 One Hundred Fourth Episode - 2018 Pendy Awards! It's the 2018 Pendy Awards! 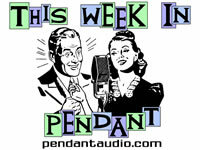 Celebrating excellence in Pendant Productions as voted on by YOU! Congratulations to all the winners and nominees, and thank you so much for listening! Here's to a great 2019! Voting is over in the 2018 Pendy Awards! We'll be back with all your winners in January! One of our upcoming new shows is now in the hands of actors and is being recorded, and looks on track for a Spring 2019 premiere. More details soon! And another upcoming show is halfway through the scripts of its first season as well, and that's not nothing. We've got preview trailers for "Richard II" act I part I in "The Pendant Shakespeare" and "Seminar" episode 84, and Jordan and Samantha Reed discuss never leaving the house, going backward, and dad jokes. That remark was inspired! The 2018 Pendy Awards are soon open for nominations! So you can nominate. And then vote. Which is a thing you WILL do... particularly if you're a citizen of the United States on Tuesday. Understand? Vote! "Seminar" and "Active Radioactive Radio" are finalists in the 2018 Parsec Awards, and one upcoming new show has a first season outline and another is already into casting! We've got a preview trailer for the complete "As You Like It" in "The Pendant Shakespeare", and Jordan and Vincent Morrison discuss feedback, running, and being the King of Discord! The "Active Radioactive Radio" webseries episode 3 cast screening is in the books, it's live to Kickstarter backers, and its public release is imminent! "The Kingery" season 10 outline is complete and the show's officially back in production and the new season has a premiere date! Our upcoming new show has all scripts locked, the release calendar's been updated through May 2020, we're now on podchaser.com. We've got preview trailers for "Active Radioactive Radio" webseries episode 3 and "Seminar" episode 83, and Jordan and Laura Bramblette discuss friends, college, and name pronunciations! Also Russian vampires would very much appreciate if you would PLEASE RATE OUR SHOWS ON ITUNES! It's TWIP 100! And if you thought we had something special planned, wow, you really do not know us at all. New pilot scripts have been read, we've got a modest bunch of "Active Radioactive Radio" news, and... web stats!? Yes, that's right, WEB STATS. It's only been.... three years? Yikes. But hey, it's not like YOU remembered either! We've got an exclusive preview clip of "Active Radioactive Radio" webseries episode 2, as well as preview trailers for "The Kingery" episode 9x12 and "The Pendant Shakespeare's" Sonnets episode 13! And Jeffrey and Susan Bridges answer hard-hitting interview questions... over and over again. It's the most un-spectacular 100th episode spectacular you'll ever hear! A whole mess of Active Radioactive Radio news is coming your way, along with a minor website update, a new locked script on an upcoming project, and hard proof the writers on "GLOW" are fans of "The Kingery" (well, I mean, it's heavily circumstantial, but just let us have this). We've got preview trailers for "The Kingery" 9x11, The Pendant Shakespeare's"King John" act V, and "Seminar" episode 82. And as a special tribute to Seth Adam Sher, we're rerunning his interview from TWIP 24 and have a special clip of him at the end of the show. We'll miss you, Seth. Planning has begun for season TEN of "The Kingery", and who ever thought we'd see that sentence? The "Active Radioactive Radio" webseries ep 2 director's cut audio mix is almost complete, as is the rough cut of ep 3! "Seminar" gets a new assistant director, a delayed commentary, and one of its past shorts is becoming a comic! Also a tease about... the airport song? Yeah, that. We've got preview trailers for "The Kingery" episode 9x10 and "King John" act IV in "The Pendant Shakespeare", and Jordan and Landon Beall discuss nimble knaves, getting it from three angles, and water gun walla. First you listen, then you're one of us! Rejoice for the website is squeaky clean, with nary a bot-induced speck of dust to be found. The rough cut of episode 2 of the "Active Radioactive Radio" webseries is done, and shooting is almost complete on episode 3, so your return to Leffdon is imminent! One script has been locked for the unnamed upcoming new show, new pitches arrived in our inboxes, and the release schedule has been updated through June 2019! We've got preview trailers for "The Kingery" episode 9x09, The Pendant Shakesoeare's "King John" act III part 2, and "Seminar" episode 81, and Jordan and William Harrison-Wallace discuss bedtimes, French accents and playing loose! It's a little like bizarro world in here. Bots hacked the Pendant site! We wish that was a joke, but alas. The good news is it's mostly cleaned up, except for the FAQ and Coming Soon pages, which we're working on. So don't go to those pages until further notice! The rest of the site and the podcast/iTunes feeds are all unaffected and perfectly safe. In happier news, footage is rolling in for "Active Radioactive Radio" webseries episodes 2 and 3, and yet more progress was made on a new upcoming show! Just what is that show, anyway? And how much progress can we make on it before we tell you what it is? Only time will tell! We've got preview trailers for "The Kingery" episode 9x08, and "The Pendant Shakespeare's King John" act III part 1, and Jordan and Russell Gold discuss usenet, pretentiousness and how it's good to be the king! Also there's a semi-philosophical discussion of morality, so there's that to look forward to. The scripts for the next "Active Radioactive Radio" webseries episodes are finished and in the hands of the cast! That means you'll be heading back to Leffdon before you know it! And scripts have been completed for our as-yet unannounced new show, so watch for news on that and a big casting call sometime soon! "Seminar" needs your scripts, "TWIP" needs your interview guest suggestions and questions, and we've got preview trailers for "The Kingery" episode 9x07, The Pendant Shakespeare's "King John" act II, and "Seminar" episode 80! And that's not all, because Jordan and Julia Eve discuss time zones, meaty roles and focusing on the words! Zero April Fools jokes will be found within (we promise, because we just don't have the time). We've got a Discord server! Do you not know what that is? It's okay, at first we didn't either. But look us up, drop by, and say hello! And scripts are proceeding apace for the "Active Radioactive Radio" webseries and a new, as yet-unannounced show, to bring more new Pendant goodness to your ear holes! We've got the preview trailer for "King John" act I in "The Pendant Shakespeare", and Jordan and Justin Fife discuss inspiration, language puzzles, and weird tangents! Even when we're sick, we bring you all the Pendant news! All the Pendant news we can remember, anyway. Who's to say how much that is? What we CAN say is it involves discussing the "Kingery" midseason hiatus, a progress update on the "Active Radioactive Radio" webseries, and some tidbits about a new upcoming show! And if that's not enough for you, we've got a preview trailer for "Seminar" episode 79, and Jordan and Olivia Steele discuss Egg Man, sweet revenge and Justin Bieber fanfic! 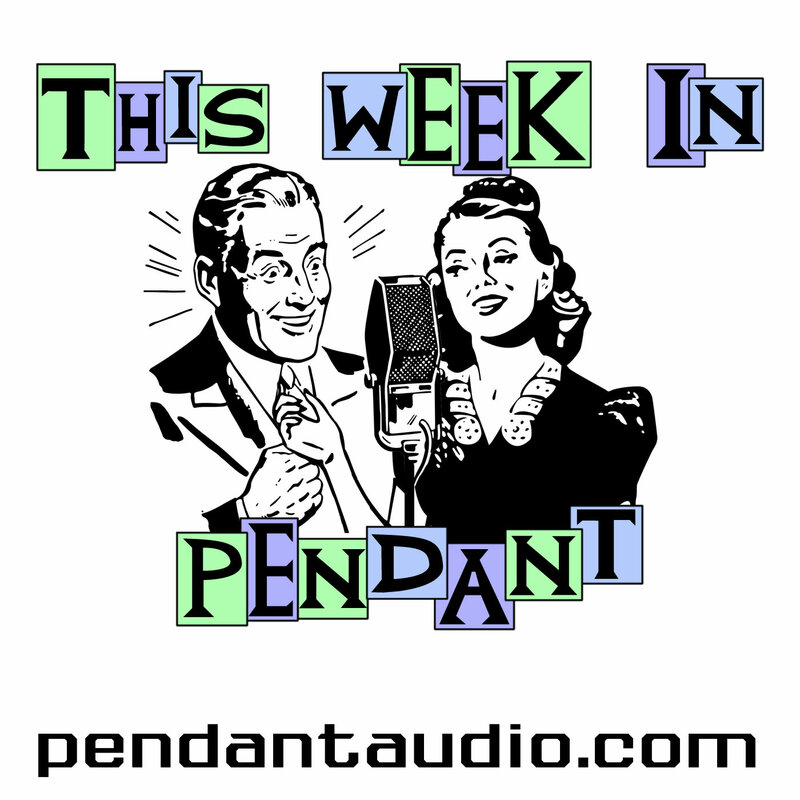 Ninety-second episode - 2017 Pendy Awards! It's the 2017 Pendy Awards! 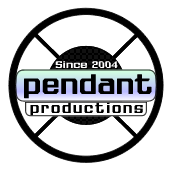 Celebrating excellence in Pendant Productions as voted on by YOU! Congratulations to all the winners and nominees, and thank you so much for listening! Here's to a great 2018! If you make one episode of TWIP the last for 2017, make it this one. Our release schedule was updated, old award wins are newly listed on the site, and the "Active Radioactive Radio" Kickstarter was funded! And that means more hot, fresh episodes will be served directly into your eyes and ears! We've got preview trailers for "The Kingery" episode 9x05, Sonnets 12 in "The Pendant Shakespeare", and "Seminar" episode 78, and interviewer Jordan Gottlieb brings you a five-year interview retrospective! All provided we can locate the correct Post-It. The 2017 Pendy Awards are open for nomination (and soon, voting! ), we have two finalists in the 2017 Parsec Awards, and our shows, cast and crew received a total of fifty-two nominations in the 2017 Audio Verse Awards! So cool. We've got news on a director change and a credit announcer change, and the Active Radioactive Radio webseries Kickstarter is live! Check out the pilot and the link to donate at activeradioactiveradio.com... please help us make more episodes for you, we literally can't do it without you! We've got preview trailers for The Kingery episode 9x04 (episode 100!) and "As You Like It" act V in "The Pendant Shakespeare", and Jordan and Rene Christine Jones discuss not being on fire, disappointing Pete, and magic fairies! It's fabulastic. Welcome to the episode where we thought we had no news but in fact had several bits of news! New projects are moving along behind the scenes, "The Kingery" will soon celebrate its 100th episode and we want YOU to be part of it, and more "Active Radioactive Radio" is coming your way, but only if YOU help make it happen! What we're saying is YOU are very special and we need you, yes, yes we do. We've also got preview trailers for "The Kingery" episode 9x03, "As You Like It" act IV in "The Pendant Shakespeare", and "Seminar" episode 77, as well as an exclusive preview clip of the season three finale of "Henderson and Havner"! And Jordan and M Sieiro Garcia discuss rock but not roll, panda bears and bedrom mics! Now cast your aspersion and peek those peaks! Want to read a month-old interview about the creation of "Active Radioactive Radio"? Now's your chance, I guess. We've got news on some shuffling in the Director Mines, and some itty bitty tidbit morsels about new shows in the pipeline! We've also got preview trailers for "The Kingery" episode 9x02, and "As You Like It" act III part 2 in "The Pendant Shakespeare", as well as an exclusive preview clip of "Henderson and Havner" episode 23! And Jordan and Joe J. Thomas discuss being filled with cells, robot ducks and saving money! Say there, retweet, share and reblog our episode releases, won't you please? Be a Pendant Pal. "The Kingery" returns this month for an unprecedented ninth season! Isn't that exciting? (Yes.) We also need YOU to help us out... with iTunes, with YouTube, and with "Seminar"! So get crackin', please! We've got preview trailers for "The Kingery" episode 9x01, "As You Like It" act III part 1 in "The Pendant Shakespeare", and "Seminar" episode 76, as well as an exclusive preview clip of "Henderson and Havner" episode 22! And Jordan and Zeke Alton discuss fan dubs, intellectual juggernauts and looking good while being robbed. Grab your small, round fruits and join us! The "Active Radioactive Radio" webseries pilot is imminent! How imminent? Three-days-from-now imminent. That's a lot of imminent! A cast screening was held and final preparations are underway. It'll stream direct into your eyeballs on July 5! And one of the other slowly gestating upcoming projects took a step forward, but that's really all we can tell you. So mysterious, right? We know. We've got a preview trailer for "As You Like It" act II in "The Pendant Shakespeare", and an exclusive preview clip from "Henderson and Havner" episode 21! And Jordan and Bill Young discuss nice aliens, loopy weirdos and voices in the basement! Do you feel accosted? Attention "Kingery" fans: Major has a special message for you. Actually the message is for everyone regardless of if you enjoy "Kingery" or not, because that's the way M Sieiro Garcia rolls. Also, the rough cut of the "Active Radioactive Radio" pilot is done! A wee bit more editing and it should be ready for your ears and eyes, and isn't that a crazy thing to say? It is! We've got a preview trailer for "As You Like It" act I part 2 in "The Pendant Shakespeare", an exclusive preview clip of "Henderson and Havner" episode 20, and a preview trailer for the big seventy-fifth episode of "Seminar"! And Jordan and Veronica Louise discuss good stuff, varied genres and caffeine! Time to get your crab-a-stab on. A director returns to the fold, the release schedule is updated, "Seminar" needs you and your jolly holiday scripts, and the "Active Radioactive Radio" pilot is only a few short scenes away from a complete rough cut! We've got a previer trailer for Act I, part 1 of "As You Like It" in "The Pendant Shakespeare" and an exclusive preview clip of "Henderson and Havner" episode 19! Meanwhile, Jordan and Anthony Fleece will fill you in on OG fans, 80s cop movies and shower singers! Also, Neil, we know you're not listening. But if you ARE, we love you. "The Kingery" season nine has a premiere date, and we're kind enough to let you know what that is. Isn't that magnanimous of us? We've also got updates on the progression of the "Active Radioactive Radio" pilot. Have you seen the stills we've been posting on social media? If not, go get a-seein'! We've got an exclusive preview clip of "Henderson and Havner" episode 18 and the "Seminar" episode 74 preview trailer, and Jordan and Jessie Moore discuss departures, badasses, and dancing disasters! We've got all the news tedbits you need. Poor Ted.